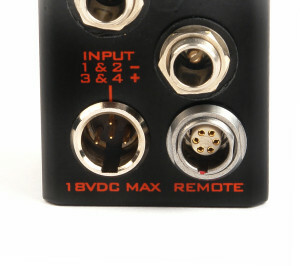 Remote Audio’s BDS system consists of a reverse-polarity protected and overload protected distribution box with illuminated bi-color on/off switch, six standard outlets, a power source (typically a rechargeable battery such as the NP-1), an input cable, and output cables to the devices being powered. BDSv4u also has a USB power outlet and a 6-pin port for remote accessories. The primary purpose of the BDS system is to enable multiple pieces of equipment to be powered by a single source, and simultaneously turn them on and off with a single switch. For this basic function, the BDSv4u may be used exactly like the earlier BDS versions that it replaces. 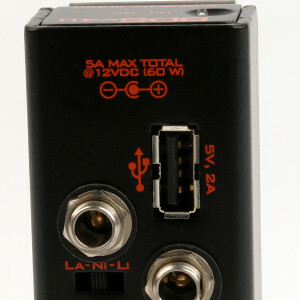 The input and output connections are the same, so all previous BDS input and output cables manufactured by Remote Audio are compatible with the BDSv4u and BDSv4. 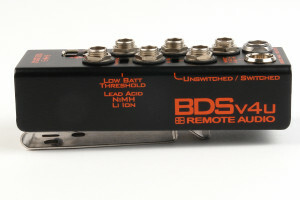 The BDSv4u design takes the system to another level of functionality with the 6-pin connector for the RM (Remote Meter) accessorie. The RM can turn on and off the BDSv4u remotely while displaying the voltage of the power source and the amperage draw of the connected equipment. 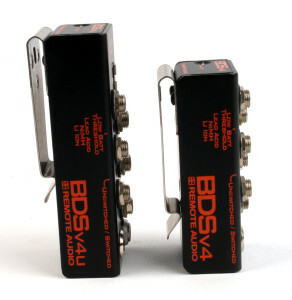 The BDSv4u can be used without the RM. In this case, the toggle switch turns the unit on and off. 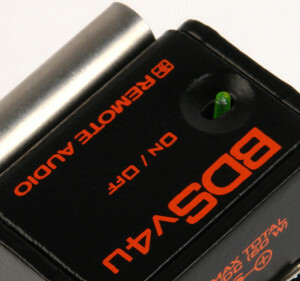 When connected to the RM and the BDSv4u toggle switch is in the OFF position, the RM controls the on/off circuit of the BDSv4u. This allows the BDSv4u box to be placed deep in the bag, out of the way. To turn the BDSv4u on or off with the RM, flip the toggle on the RM. The RM will then display the voltage of the power source. Pressing the “AMPS” button will display the current draw of the devices being powered for as long as the AMPS button is pressed. If the BDSv4u toggle switch is in the on position, the RM will not turn off the BDSv4u. In this case, the on/off function of the RM will only turn on and off the meter display. The outlet connectors on the BDS box are a special switching type that requires a long-shaft mating plug with a 2.5mm hole. This connector set was chosen for its strength and so that unused (exposed) outlets on the box are not active until a cable with the proper mating connector is plugged into it, helping prevent accidental short circuits. 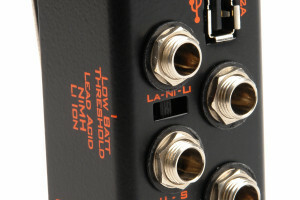 Output cables by Remote Audio are manufactured specifically for use with the BDS, and come with unique low-profile right angle locking connectors. Therefore, it is recommended that only Remote Audio brand output cables be used. The polarity of the outlets is “center positive”. Y-cables are available for connecting more than six devices to your BDS unit. Input cables, battery adapters and AC-DC adapters are also available from Remote Audio. The BDSv4u has a standard USB port to facilitate charging or powering anything that will run or charge via USB, such as a smartphone or handheld recorder. Unlike many other 12V to 5V USB adapters, which are limited to 1A, this USB port is able to deliver a regulated 5V at up to 2A (10W). The BDSv4u’s USB port is wired to conform to the official USB “Dedicated Charging Port” specification. Devices that do not conform to that specification may not be able to take full advantage of the port’s 2A capability. For instance, most Apple devices use a proprietary circuit to charge at the maximum rate (higher current). When connected to the BDSv4u, the iPad will show a “Not Charging” status message on the toolbar. In that case, it is being trickle-charged when awake and charged when sleeping or in standby mode, allowing the iPad to be run indefinitely (or until the BDS’s power source is drained). 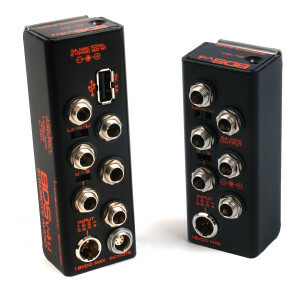 This design choice was made to conserve battery life for more critical functions, such as powering the recorder/mixer in the bag. If faster charging for Apple devices is desired, we recommend using Remote Audio’s BDSUSB adapter cable, rated for 1A @ 5V and containing Apple’s proprietary circuit.. Note: When the USB is at maximum capacity (2A @ 5V), it is important to remember that the 2A doesn’t directly count against the 5A maximum total for the whole box, since they are defined at different voltages. It may be easier to think of it in terms of Watts. 2A @ 5V is equal to 10W (2 * 5), and the entire BDSv4u is limited to 60W (5A * 12V). So, the USB port can provide a maximum of 1/6th the total output of the BDSv4u, or the equivalent of ~833mA at 12V, not including the slight losses of the 5V regulator circuit. For simplicity sake, if you’re pulling a full 2A from the USB port, it is safe to assume that you’ve got about 4A remaining capacity for all the other output jacks, which is more than sufficient for nearly all ENG bag configurations. The input connector on the BDS box is a common TA4M (miniature 4-pin male XLR) with the standard scheme of “pin-1 NEG, pin-4 POS.” To improve reliability and reduce voltage drop, the contacts are doubled 1-2 and 3-4 at the circuit board. Therefore, if you wire your own input cables, it is recommended to connect pins 1-2 and 3-4. The power indicator LED built into the BDS box switch can be used to confirm proper polarity of the input cable (if it illuminates, the polarity is correct). The indicated outlet can be either “switched” or “unswitched.” “Switched” means that the outlet turns off and on via the main toggle switch. “Unswitched” means that the outlet is always on when power is present. The factory default for that outlet is “unswitched.” This feature is often desired for the audio mixer. For example, in this configuration, when only the mixer and boom mic are needed, turning off the BDS box will turn everything off (receivers, etc.) except for the mixer. This is a convenient way to turn off unnecessary items and extend the life of the battery. The status of the outlet can be easily reversed to “switched” by sliding the nearby switch using a toothpick or jeweler’s screwdriver. Note: When using a metal tool to change the switch position, make sure the BDS is powered off to eliminate the possibility of short-circuits. The illuminated toggle switch is a bi-color type that indicates when your power source (typically a battery) falls below a certain voltage level. This threshold voltage is selectable via a switch on the face of the BDSv4u and BDSv4. When the battery voltage falls below the selected threshold, the illuminated toggle will switch from Green to Red. The actual supply voltage is influenced somewhat by the current draw of connected devices, so some experimentation may be needed to find the correct threshold for your setup. The BDSv4u and BDSv4 have auto-resetting protection against output short circuits and loads in excess of 5A @ 12V (60W), with each outlet capable of handling up to 3A. If the BDS fails to pass power, it could be due to an overload or a short circuit. In the case of a short circuit of an individual output cable or piece of gear, only that outlet’s breaker will trip, protecting the other connected gear from shutting down. If a piece of gear fails to power up, that output cable should be checked for continuity (shorted or open conductors) with a multi-meter, or replaced entirely. The BDS box will also protect itself when connected to loads of over 5A, and the on/off toggle switch will no longer be illuminated. However, it is very rare for field audio bags (the primary intended use for the BDS) to have current draws in excess of 5A. As a protective feature for devices being powered, in the event that an input cable or battery adapter is miswired, the BDSv4u and BDSv4 will not pass reverse polarity voltage to its outputs. Unlike some reverse polarity protection circuits, the BDS circuit does not cause a voltage drop during normal operation. Thousands of satisfied field audio professionals are using the BDS system to power their equipment. However, it is possible to have unwanted audible noise induced into audio systems by a common (shared) power source. To optimize your system, it is recommended to use line level signals instead of mic level signals whenever practical. Also, turn phantom voltage off of all preamp inputs that are connected to non-microphone devices. If noise is still heard, unplug one device at a time from the BDS box to determine the cause. Notice any change in noise associated with the removal of each device. If the noise goes away after unplugging a particular device, try powering that device with a separate battery. If using a separate battery causes the noise to go away, then the problem is a ground loop associated with the combination of a common power source and audio grounding schemes. Be aware that this noise will not be removed with “LC” filters found in some distribution boxes. use a power isolator cable such as the Remote Audio Juicer cable. The newest evolution of the BDS (Battery Distribution System) advances the concept of efficient multi-device powering with valuable new features in two new models, the BDSv4 and BDSv4u. Both models feature a new low battery warning LED and panel-accessible selectors for making the 6th outlet switched or unswitched, and for selecting the low battery warning threshold. 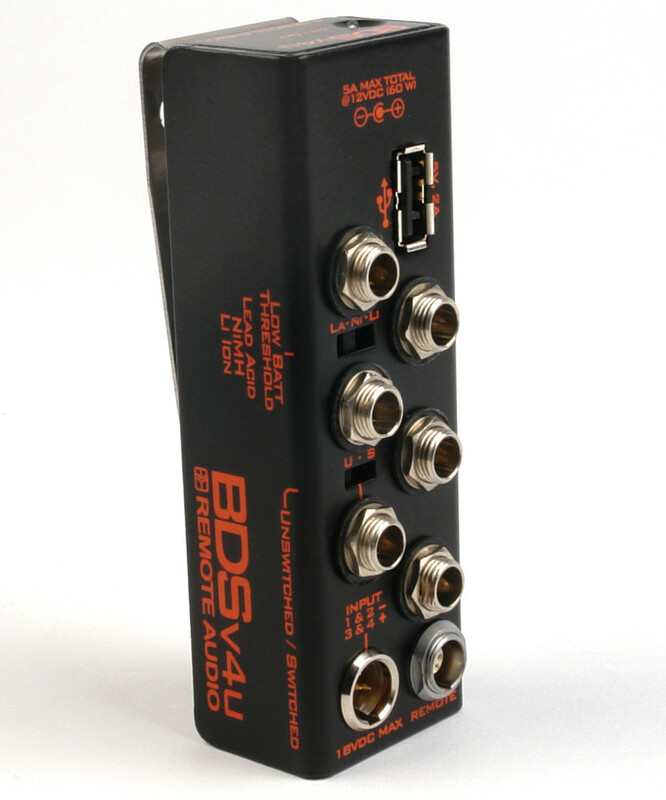 The flagship of the new BDS line, the BDSv4u, has a built-in USB power outlet and an accessory port. The USB outlet is a 2A circuit capable of powering and charging devices as small as the iPod Touch and as large as an iPad. 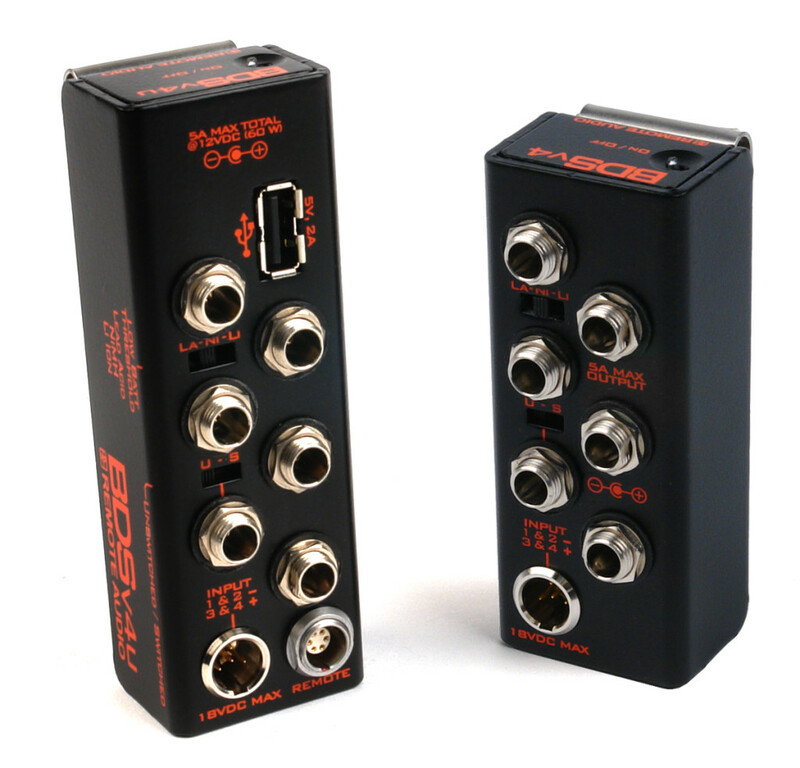 Even with this additional outlet, the v4u is only about ¼-inch longer than its predecessor, the v3. 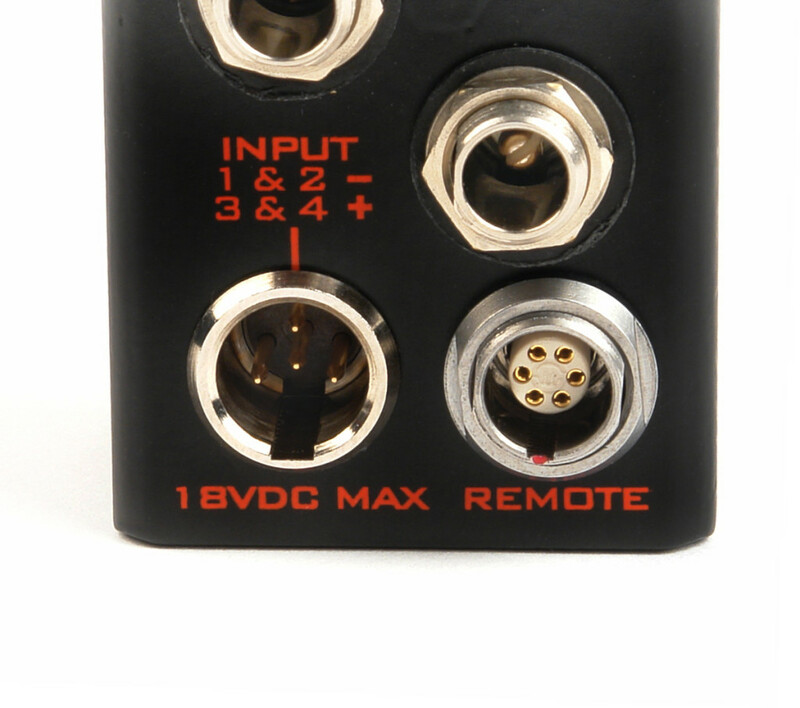 The BDSv4u also has the same remote port as the BDSv3, for use with accessories such as the RM (Remote Meter) and RS (Remote Switch). The economy model of the new BDS family, the v4, has the same features of the v4u, minus the USB and remote ports. The v4 is very compact–smaller than the v4u, and even smaller than its predecessor, the BDSv3.As with all previous versions of the Remote Audio BDS, all input and output cables and all accessory devices are compatible with the BDSv4 and BDSv4u. Power Switch: Recessed toggle, illum. Green when Power “ON”, Red when voltage falls below selectable threshold. Power Switch: Recessed toggle, illuminates Green when Power “ON”, Red when voltage falls below selectable threshold. 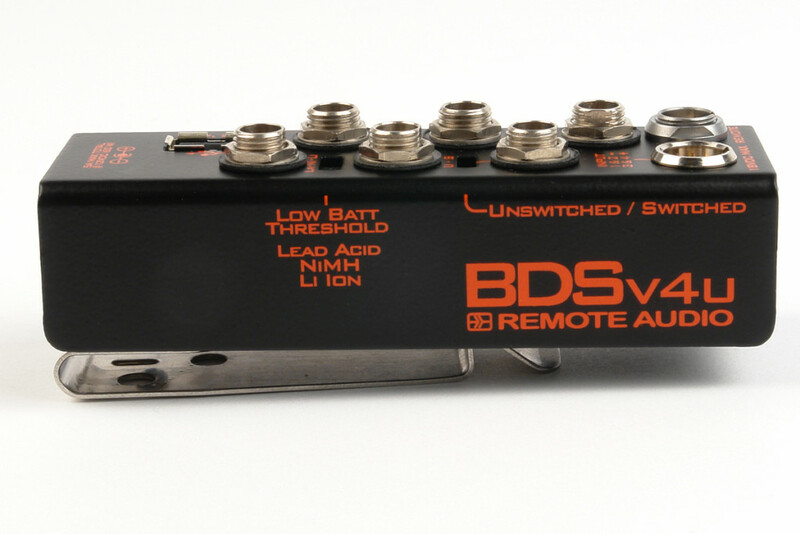 The BDS, developed by Remote Audio, has been the standard power management system in ENG audio bags for over a decade. Once considered a luxury, the ability to power multiple pieces of audio equipment with a single rechargeable battery is now a necessity as equipment demands become more complex. The BDS system accommodates this need with a reliable, convenient, and robust design.